When Bangladesh was reeling from brutal terror attack in the heart of its capital Dhaka on ‘Black Friday’ early this month, the relatives of the Japanese slain by Islamic terrorists are equally mourning for their dead. Literally the world woke up on Friday to hear the horror of Jihadists quickly recognised as militants to terror network Islamic State, or ISIS and also ISIL. The seven Japanese, five men and two women who were dining at a posh Spanish restaurant in Gulshan diplomatic zone were slain because they were not Muslims and also interpreted Buddhism as a Godless religion. That was the only crime of the Japanese nationals who used to work for the Japan International Cooperation Agency, or JICA in Bangladesh. They were employees of three separate Tokyo-based consultancy firms who went to dine together at the restaurant attacked by terrorists, writes the Japan Times. The 20 victims who died in the July 1 carnage in Holey Artisan Bakery and O’ Kitchen including nine Italians, an American, an Indian and some Bangladeshi nationals were at a wrong place at a wrong time. The seven Japanese nationals killed on the night of horror, were working hard for development, the Japan Bangladesh Chamber of Commerce and Industries (JBCCI) has said in a statement. They were consultants for the JICA, Japan top foreign funding agency – and six among them were surveyors for the project to build a Metrorail in Dhaka. “Our hearts are bleeding for this unbearable loss of lives of our Japanese friends, who were working hard for the development of Bangladesh,” said the statement signed by JBCCI Secretary General Tareq Rafi Bhuiyan. The gunmen who staged deadliest terror attack had tried to spread fear using the phones of the people they had taken hostage, a survivor has told Japan public broadcaster NHK. A Bangladeshi woman, who was among the hostages held at the restaurant, as saying that the attackers had told them to receive phone calls from families and friends, and inform them what was happening. She said the assailants listened in on the phone conversations the hostages had. She added that some of them had been ordered to ask their families to urge police not to raid the restaurant. Police told NHK that the terrorists may have wanted to use the calls to spread fear about their brutal actions, including the killing of the foreigners. The assailants never intended to negotiate with authorities. The foreign hostages were hacked to death within the first 30 minutes of the siege. 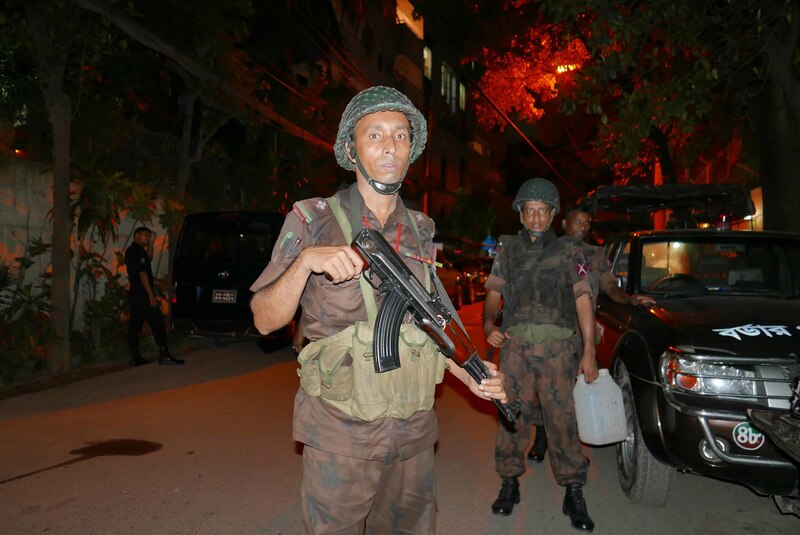 In a dramatic commando raids by para-troopers from Bangladesh Army rescued only one Japanese national from the ill-fated Gulshan cafe after the overnight siege the next morning. Unfazed by the deadly attack, JICA, the Japan government’s aid unit, has promised to continue supporting development projects in Bangladesh, said its President Shinichi Kitaoka in a statement posted on its website on Wednesday. “It is impossible to suppress our anger at the criminals who carried out this act of terrorism,” Kitaoka said. The JICA president’s statement came following speculations that JICA might change the way it works in Dhaka after the attack in which 17 foreigners including those Japanese were killed. Japan is one of the largest bilateral donors in Bangladesh with its citizens working even in remote parts of the country as volunteers. Recently, it signed the biggest-ever soft loan package for six mega projects which include power, road communications and disaster management. Six of the seven Japanese killed in the terror attack were surveyors for Dhaka’s Metrorail project, the road transport minister Obaidul Quader has said. “Their demise will not affect the project. 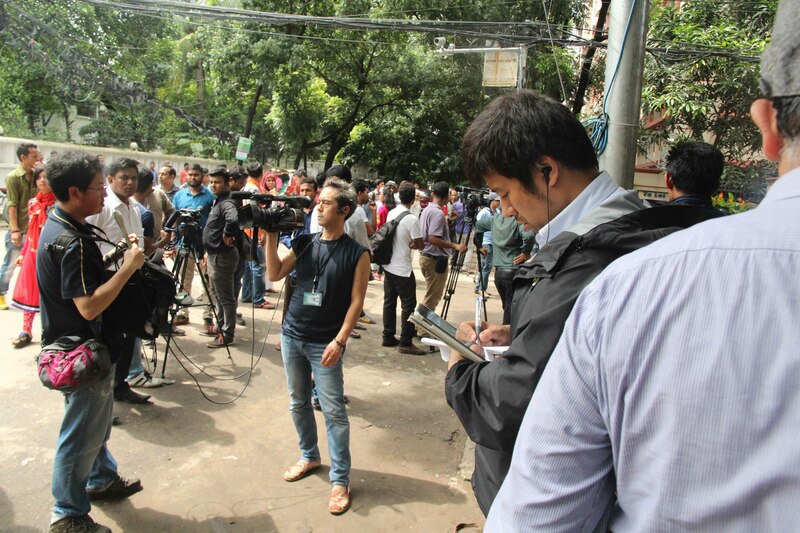 The Japanese government knows the attack on the Gulshan cafe is part of a global terror scheme,” the minister assured the journalists. 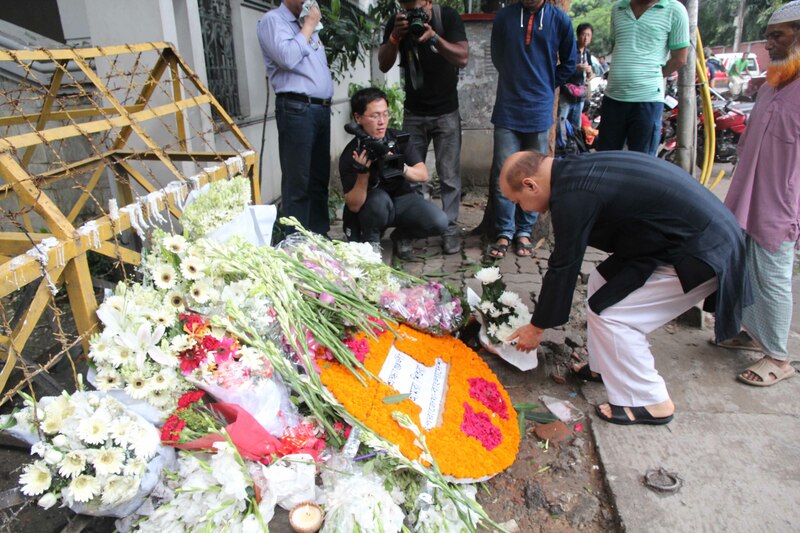 The Japan embassy officials in Dhaka identified them using photos of their dead bodies and personal belongings, the report said quoting Chief Cabinet Secretary Yoshihide Suga. Japan’s Foreign Minister Fumio Kishida has told reporters in Tokyo that the government will fly the families of the victims to Dhaka. 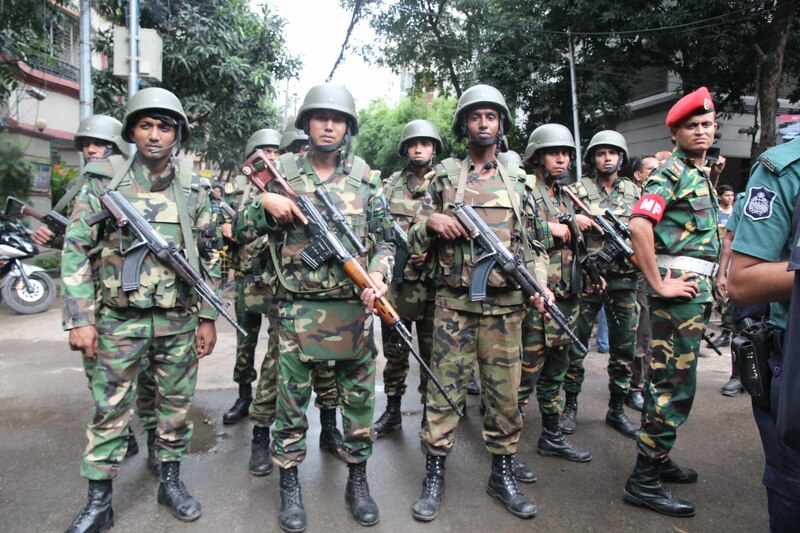 Japanese government urgently prepared for the relatives to ensure that they can leave for Dhaka on Sunday. Japanese Prime Minister Shinzo Abe earlier said he was “profoundly outraged.” He termed the deaths of the Japanese in Friday night’s unprecedented attack on a Gulshan café “a truly regrettable outcome”. “All of those who lost their lives had gone to Bangladesh in the spirit of wanting to work for the good of that country,” he said. Abe sent the victims’ families in a special aircraft to pay respect, and also sent the state minister for foreign affairs to make an on-spot assessment of ground realities, as he vowed “to devote our utmost efforts to shed light on this incident”. Shinichi Kitaoka, President of JICA, expressed deep sorrow and regret for the loss of those lives of the consultants in a JICA project and were active in improving the urban traffic situation in Dhaka. The JICA chief said that in order to ensure safety, JICA’s staff and consultants still in Bangladesh “may be urged to leave the country or stay at home depending on the situation”. 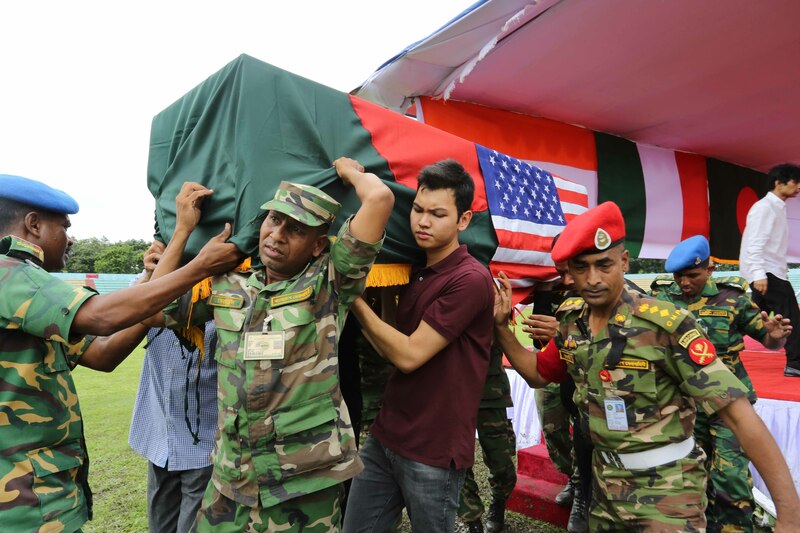 Meanwhile, throughout the night Japanese state minister for foreign affairs Seiji Kihara who air dashed to Dhaka, along with his Bangladesh counterpart Shahriar Alam met the families and were found to console them while the families paid respect to the victims in military cantonment area. A minibus with relatives of Japanese victims of an attack also visited the site of horrow at the Spanish eatery on July 4. 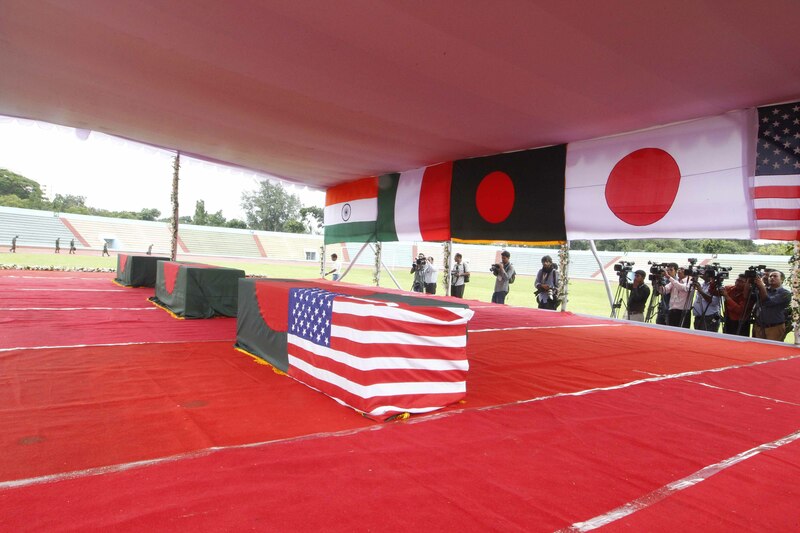 Japanese families requested not be covered by media as they have paid respect to the bodies soon after their arrival in Bangladesh on Sunday night. Kitaoka also said after a Japanese man was killed in northwest Bangladesh last October “we elevated our safety measures and have been alerting all JICA-related personnel to the danger”. Earlier, last year when a Japanese national, Kunio Hoshi, was killed in northern part of Bangladesh, Japanese embassy made three requests to Bangladesh media. “And JICA was just recently warning them again to be extra cautious, particularly during and just after Ramadan. It is quite regrettable that this result came about despite those efforts,” Kitaok said. The families and Japanese senior officials flew back to Tokyo on Monday along with the coffins of the slain innocent victims. At Haneda airport, JICA President Shinichi Kitaoka offered flowers to the coffins on Tuesday. Japan embassy in Bangladesh has not announced plans to reduce staff numbers, one diplomatic source said, the British and American missions in Dhaka asked only essential staffs to stay on. 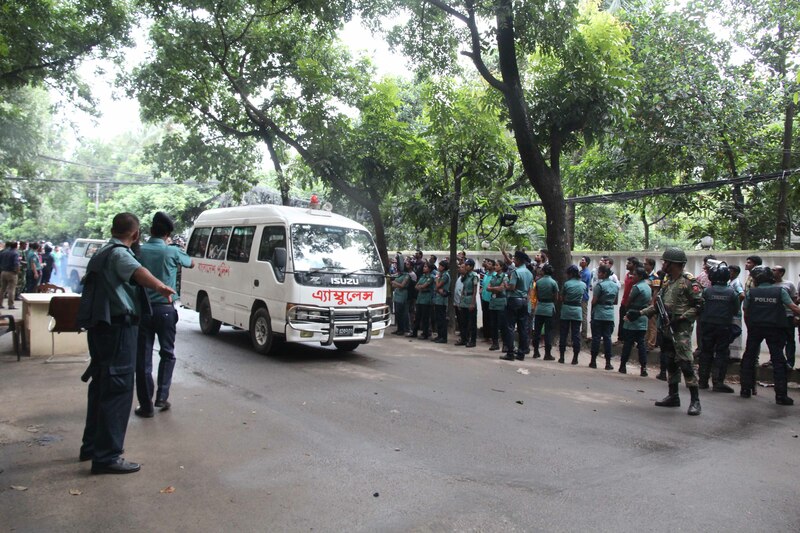 Meanwhile, foreign companies with nationals working in Bangladesh’s garment and building industries have suspended travel to the country and told workers there to stay put at their apartments at home after a deadly attack by Islamist militants. Fast Retailing Co, the Japanese owner of the UNIQLO casual-wear brand, said it would suspend all but critical travel to Bangladesh and had told staff there to stay indoors. UNIQLO has 10 Japanese staff in Bangladesh, one of its major production hubs outside China, and was among the first to confirm it would tighten travel restrictions already in place after attacks last year. A spokeswoman said all but critical travel was suspended. Japanese construction companies Obayashi Corp and Shimizu Corp, both with more than a dozen employees working on bridge projects in Bangladesh, said they advised staff to stay indoors. Those five Jihadist in their 20s, were shot and killed by commandos were mostly students from middle-class families. All the five were missing for long and parents had filed missing person cases with the police stations. Police till the terror attack had no clue of their whereabouts. According to the reports, most belonged to well-off families and studied at some of the city’s top Western-curriculum schools before going missing earlier this year. 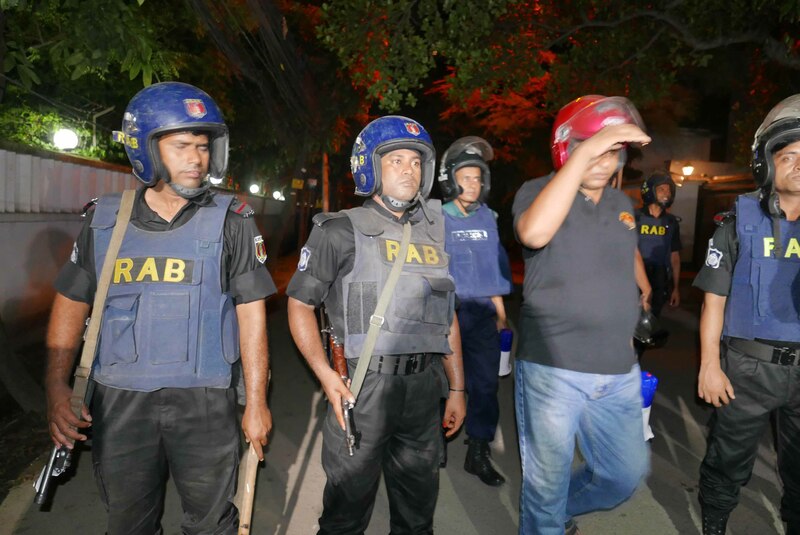 They were said to have frequented restaurants such as the Holey Artisan Bakery in the upscale Gulshan section of the capital, which was packed Friday night with Bangladeshi and expatriate diners during the Muslim holy month of Ramadan. Rohan Imtiaz epitomized Bangladesh’s new urban middle class. The son of a politician, he was a business student at one of the best private universities in Dhaka. His future appeared bright. Imtiaz was missing since January last. Although his father, S.M. Imtiaz Khan Babul, a mid-level official in the governing Awami League party, filed a police report and met with various law enforcement agencies and even the Home Minister, six months passed with no trace of his son. Imtiaz finally surfaced over the weekend in a shocking way: He was identified as one of five suspected Islamist radicals who stormed a Dhaka restaurant, took patrons hostage and methodically killed 23 people, most of them foreigners, in an attack that was claimed by Islamic State. Their names were first reported after the Amaq news agency, which is affiliated with Islamic State, released photos of the men following the attack, allowing friends to identify them on social media. Meer Same Mubashher, 18, went missing Feb. 29 from his home in the Gulshan area of Dhaka, authorities said. His father, Meer Hayet Kabir, filed a missing persons report. During the investigation, police found security camera video showing Mubashher, who was believed to be going to see his private tutor, leaving his car during a traffic jam, the Prothom Alo daily newspaper reported. Another suspect was identified through social media as Nibras Islam, described as a young man from an upper-class family who studied computer science and played for his university’s soccer team. Bangladesh police said another gunman, Shafiqul Islam Uzzal, 25, hailed from the northern district of Bogra. 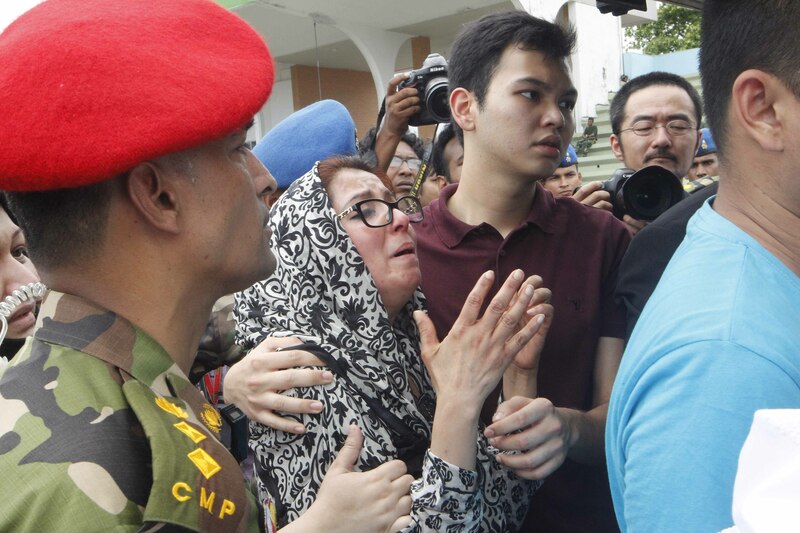 Local media reported that he had left home six months ago for an Islamic proselytizing mission, and his parents identified him after they were shown photographs. As authorities question family members and some of the hostages who were freed when army commandos raided the restaurant Saturday morning, the backgrounds of the young men offered insight into the reach of Islamic State’s extremist propaganda.